I spent last week on the southern edge of North America. But I wasn’t surfing or beach-combing or sipping margaritas on white sand by a sparkling blue-green sea. 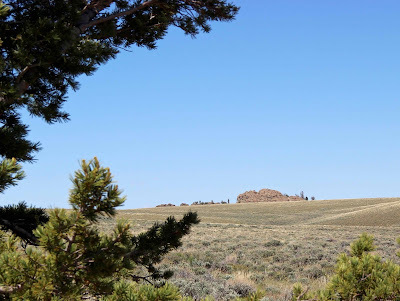 Instead, I wandered in bright sunlight and incessant wind around ancient rocks standing above rolling sagebrush-grasslands. More precisely, I was on what once was the southern margin of North America, about 2.5 billion years ago. That was near the end of the Archean Eon, back when the Earth was still a young planet busily creating, expanding, and aggregating its continents. Fast-forward two billion years, by which time North America was shaped pretty much as it is today. 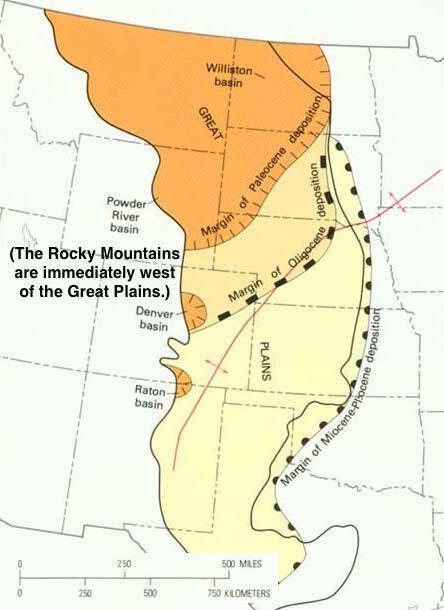 The continental interior was undergoing 30 million years of major deformation, called the Laramide Orogeny. 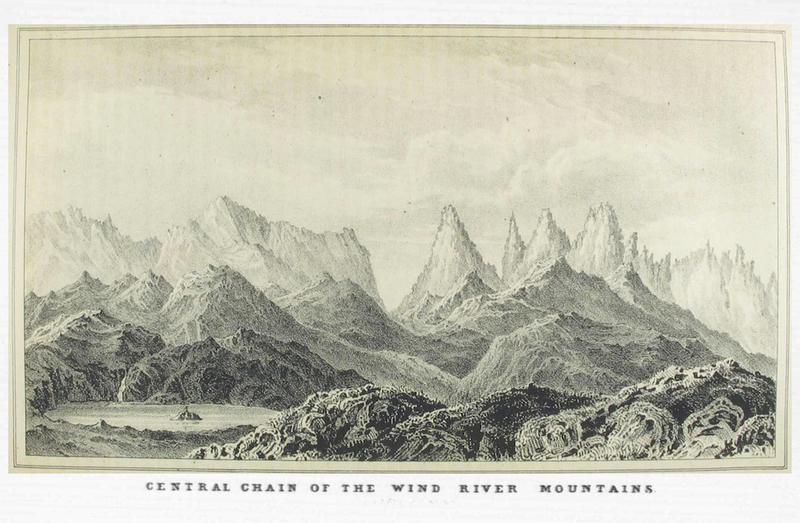 The Rocky Mountains were uplifted, including most mountain ranges in Wyoming. 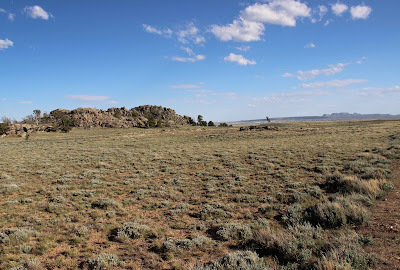 Laramide mountain ranges in Wyoming. Stippling indicates exposed Archean rock. After Frost et al. 2006. 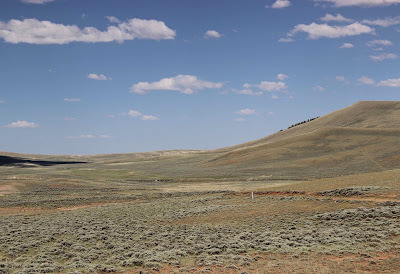 The Wind River Mountains in western Wyoming are an exemplary Laramide-style uplift, with sloping sedimentary strata on the northeast side and a steep reverse fault on the southwest. 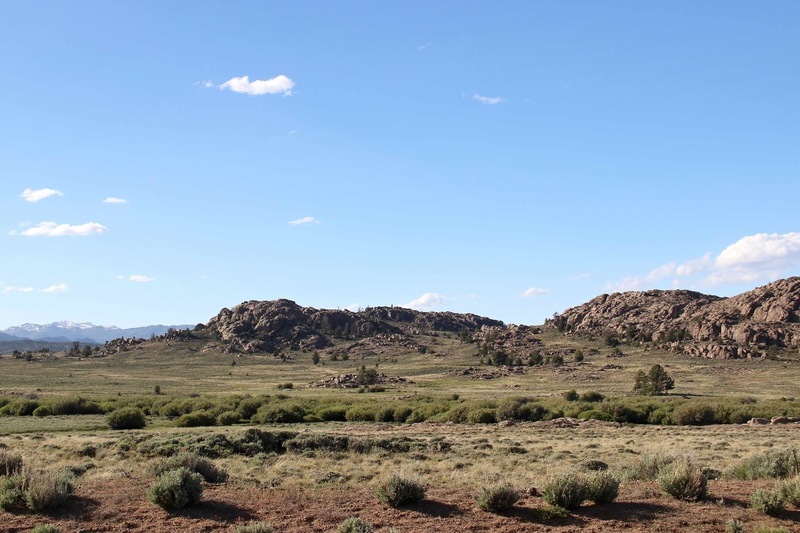 Critical to this story, previously-buried ancient Archean rocks were lifted high, and are now exposed over an area of more than 10,000 sq km and to 4000 m elevation (13,804 feet at Gannett Peak). In 1842, Brevet Captain John C. Fremont led his Exploring Expedition to the Rocky Mountains through the southernmost part of the Wind River Range. 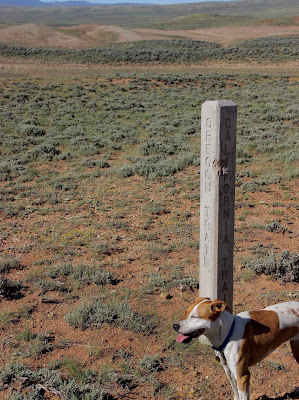 He had heard it was an easy way to cross the Continental Divide, with plenty of good water (not alkaline). 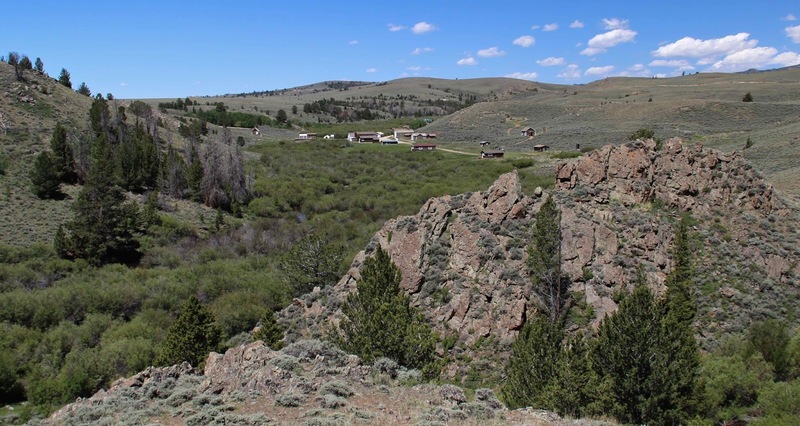 They traveled west up the Sweetwater River to South Pass, and found the grades were indeed gradual—so much so that he had to look carefully to find the actual divide. 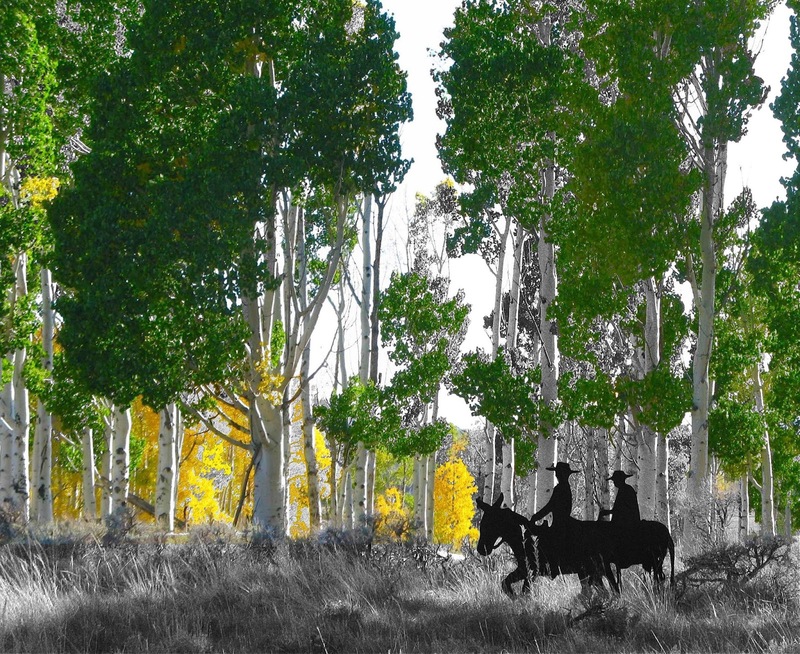 Fremont's encouraging description of South Pass helped launch the great westward migration of the mid-1800s. Over the next twenty years, several hundred thousand hopeful souls crossed South Pass, bound for promised lands in Utah, Oregon and California. 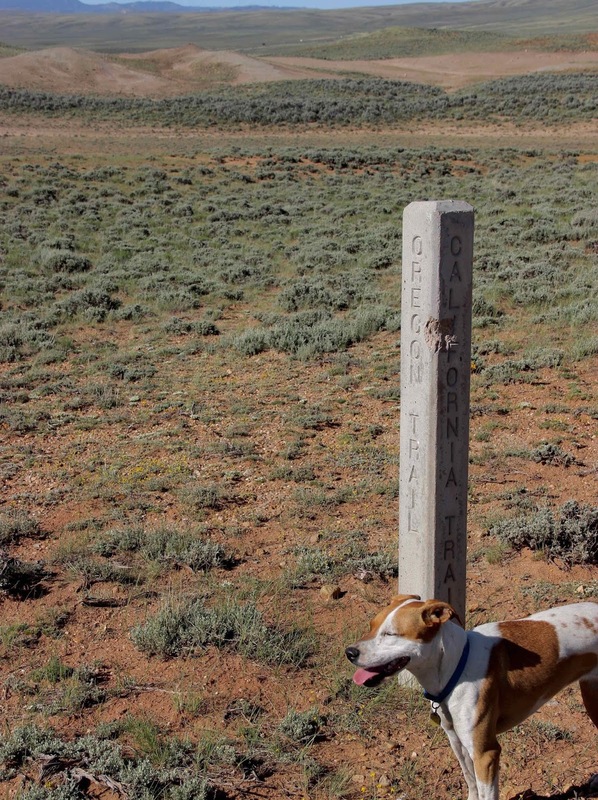 Concrete posts now mark the Oregon–Mormon–California trail. 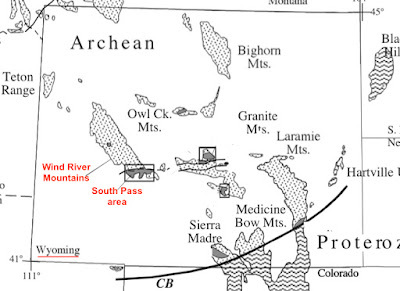 South Pass is left of center. Not many travelers on the Oregon Trail these days. The South Pass area would host the biggest gold rush in Wyoming, but would not live up to Hayden’s great expectations. Pioneering photographer William Henry Jackson traveled with Hayden. He took this photograph of South Pass City from today’s Jackson Point, accessible by a short trail. The outcrop in the foreground is made of Hayden’s “metamorphic slates”—now classified as Archean metagraywacke (slightly metamorphosed graywacke) and graywacke schist of the Miners Delight Formation (Hausel and Love 1992). 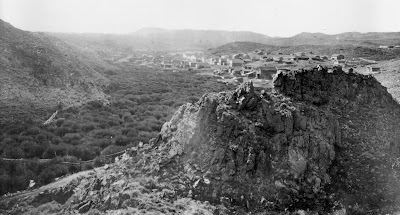 South Pass City in 1870. South Pass City today—restored, and a State Historical Site. Quartz in foreground; another granite outcrop mid-photo. Looking southwest. 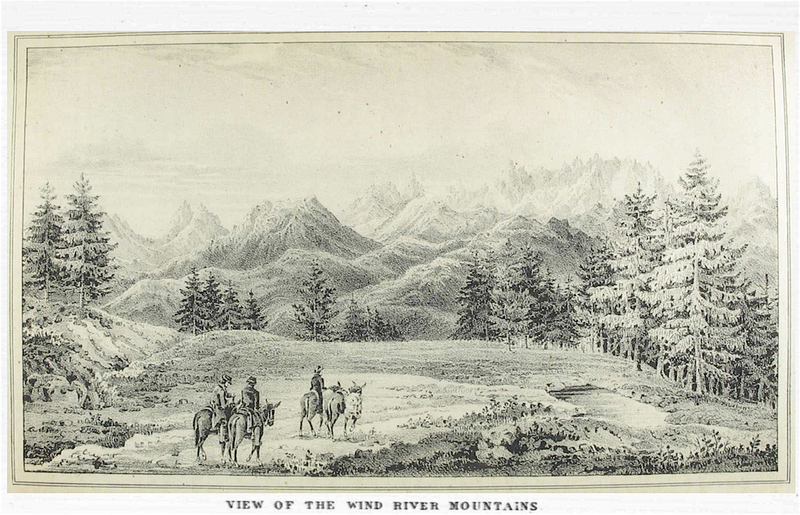 Hayden lamented his too-short stay in the Wind River Mountains, and hoped to return for further study. But he never did, and perhaps it was just as well. Hayden was wrong. 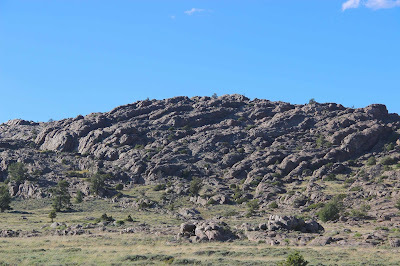 While the range may be a straight-forward example of Laramide-style mountain-building, the great mass of exposed Archean rocks are not at all simple. They came to be in the far distant past, starting maybe 3.2 billion years ago, and have been greatly modified by subsequent events. They’re a tough read, and geologists struggle to explain how they came to be. High peaks of the Wind River Mountains in the distance, still snow-covered in mid-June. Some geologists think that in late Archean time the South Pass region was an area of continental growth. 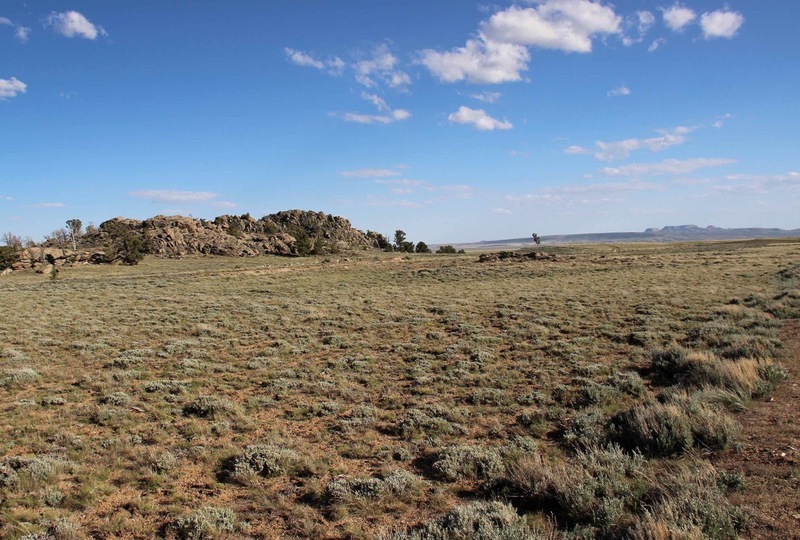 Fragments of crust (terranes) and strings of islands collided with and were amalgamated to the Wyoming Craton, a small continent that would go on to become part of North America. But others think the Earth’s crust was still too young and hot for plate tectonics—pointing out Archean rocks with no modern analogues (e.g. Hamilton 1998). At 2.5 billion years old, Fremont’s “irregular lumps” of granite in the South Pass area are among the youngest Archean rocks in the Wind River Mountains. 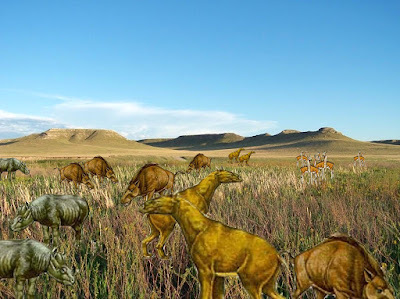 They were intruded on the southern margin of the Wyoming Craton near the end of the Archean, when the craton was about to coalesce with its brethren to form the supercontinent Kenorland (source). 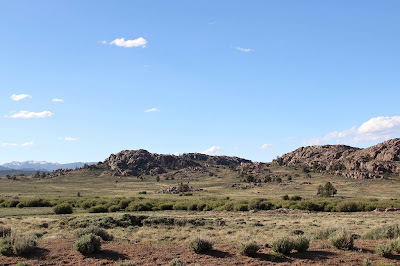 The granite crops out sporadically, rising above rolling terrain developed on much younger sedimentary rocks. 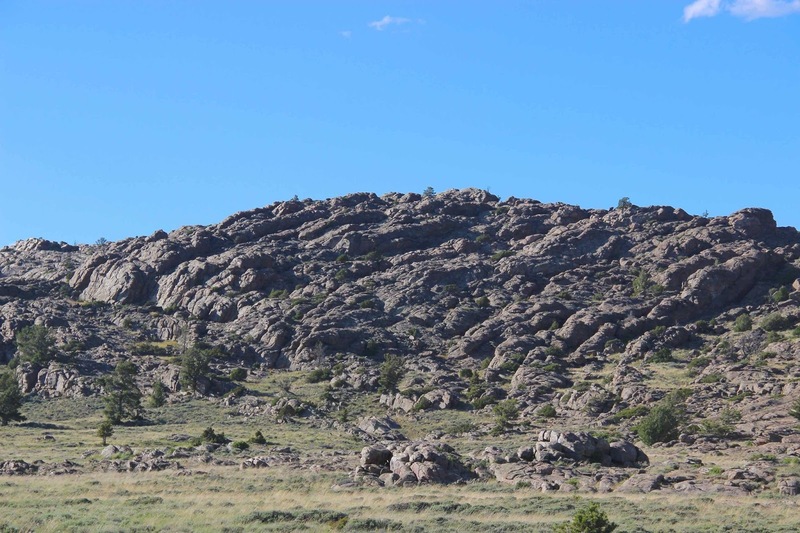 Late Archean granite rises above the Miocene Split Rock Formation, only 16-17 million years old (source). South Pass granite, with the Oregon Buttes on the far horizon. For most immigrants, the buttes marked the halfway point on their journey west. Fremont, JC. 1845. 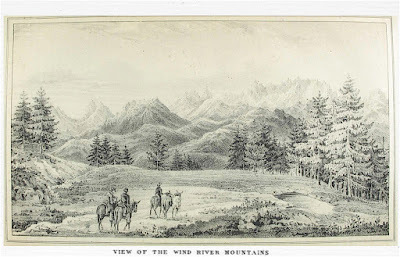 Report of the Exploring Expedition to the Rocky Mountains in the year 1842, and to Oregon and North California in the years 1843-44. Washington: Gales and Seton, Printers. Frost, BR, et al. 2010. 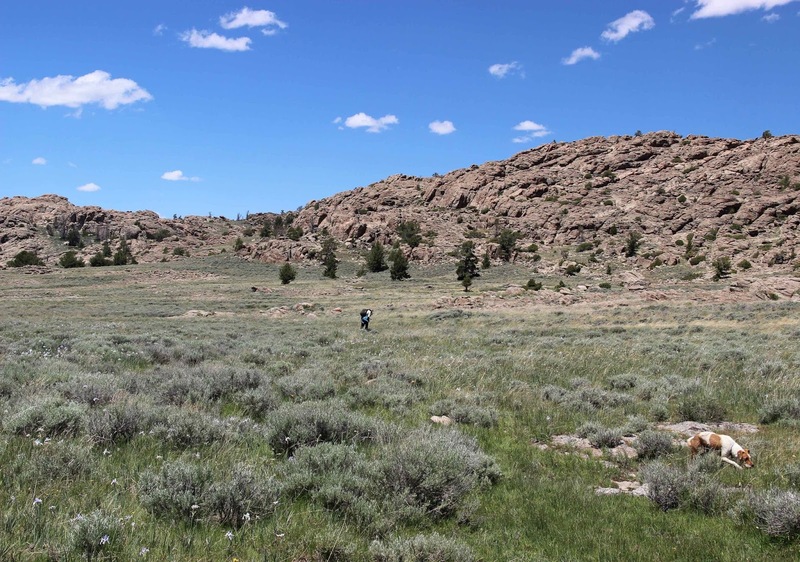 Late Archean structural and metamorphic history of the Wind River Range: Evidence for a long-lived active margin on the Archean Wyoming craton. GSA Bull. 112:564-578. Frost, CD, et al. 2006. Archean crustal growth by lateral accretion of juvenile supracrustal belts in the south-central Wyoming Province. Can. J. Earth Sci. 43:1533-1555. Hausel, WD, and Love, JD. 1992. 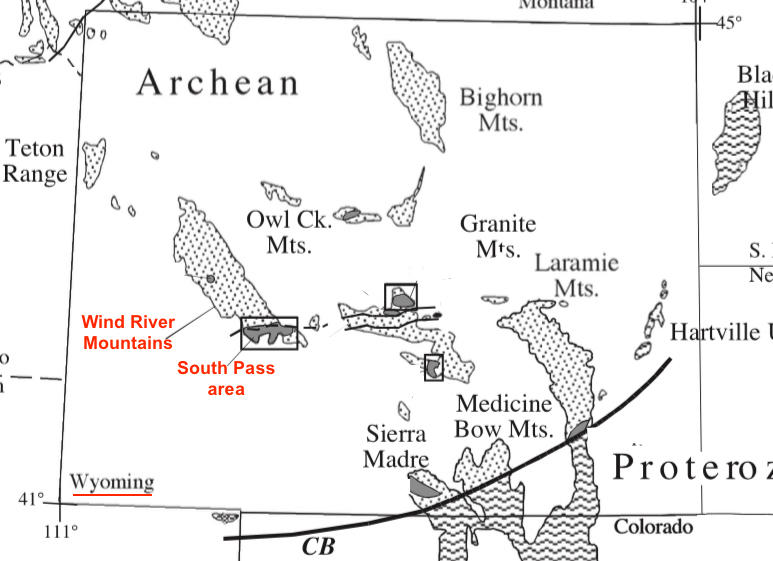 Field guide to the geology and mineralization of the South Pass region, Wind River Range, Wyoming (42nd Field Conference, 1991). 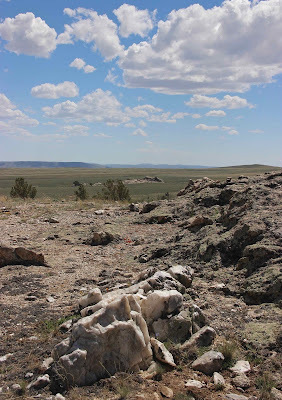 Laramie: Wyoming Geological Association. Hayden, FV. 1871. Preliminary report of the United States Geological Survey of Wyoming and of contiguous territories. Washington: Government Printing Office. Take Nebraska Highway 29 from Mitchell north to Harrison and you will drive through miles and miles of rolling grasslands beneath skies that seem to go on forever. 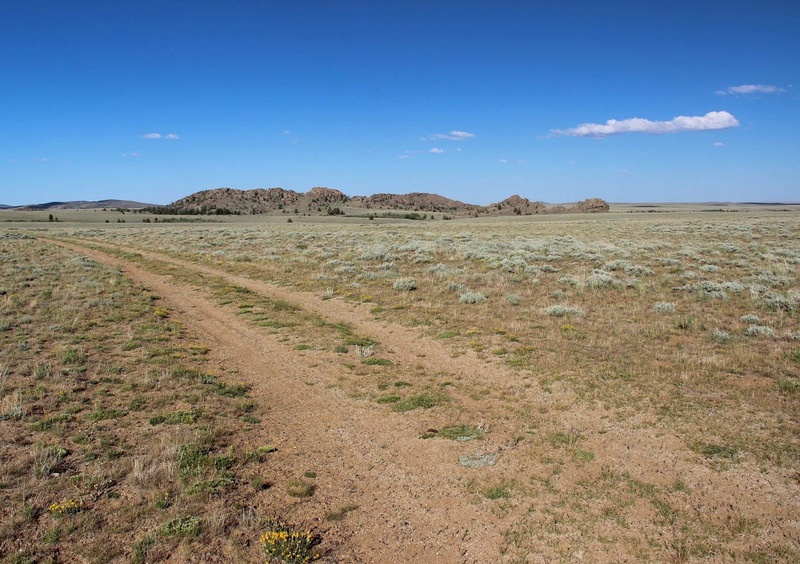 You might see occasional cattle, or pronghorn antelope. 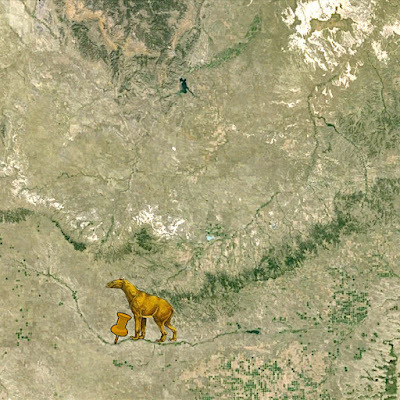 Make the same trip twenty million years ago and you would drive for miles and miles through rolling savannas beneath skies that seem to go on forever but … instead of the occasional animal you’d see multitudes of mammalian creatures—some huge, some kind of familiar, others quite strange. This was northwest Nebraska during Peak Mammal, an American Serengeti. 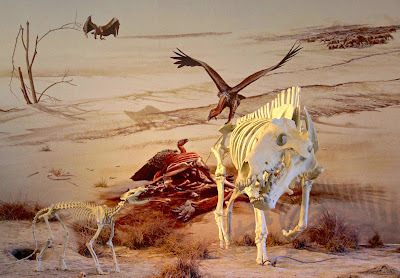 Answer to recent geo-challenge: Agate Fossil Beds National Monument 20 million years ago (early Miocene). Diorama by Jay Matternes; source & source. Prehistoric mammals have been largely upstaged by the dinosaurs with their over-the-top charisma. This is naive, and a real shame. After all, it was mammals that underwent “one of the most spectacular evolutionary radiations ever documented” (Prothero 2006). 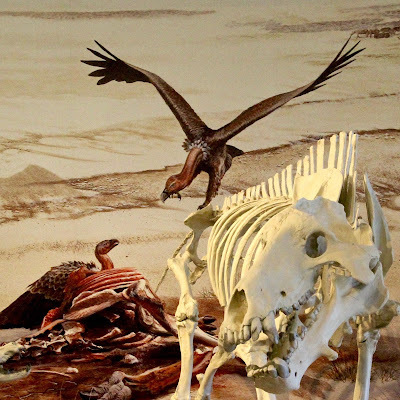 With the extinction of non-avian dinosaurs (birds are dinosaurs) 65 million years ago, small mammals came out of the shadows and begin to diversify—a diversification that accelerated into an explosion. 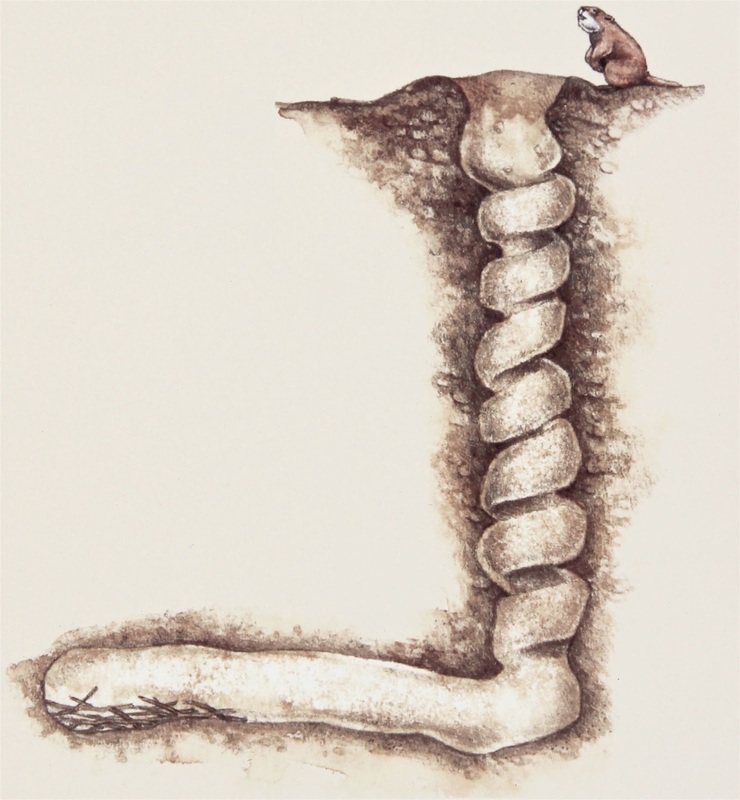 We know of only only eight species of placental mammals from 65 million years ago, mostly tiny shrew-like creatures. But just ten million years later, there were on the order of 100 groups of species (genera), including all major orders in existence today—“from shrews and rodents to giant whales and flying bats” (Prothero 2006). 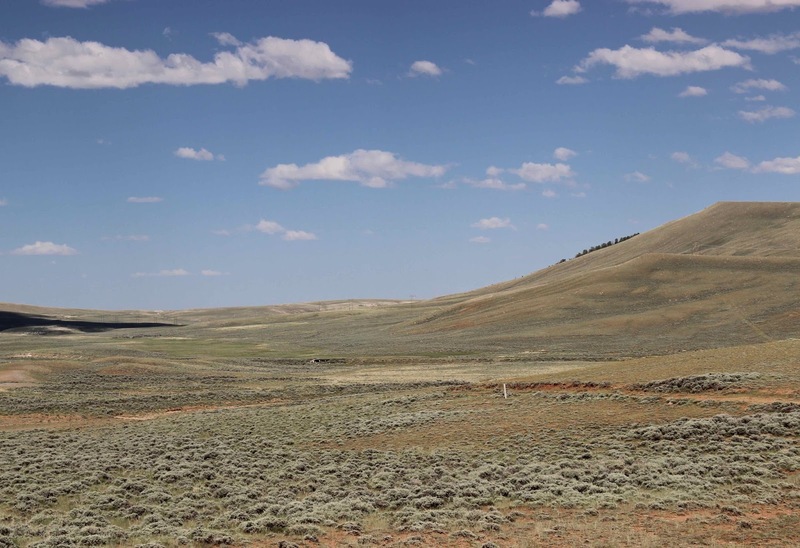 The best record of these exciting evolutionary times is contained in 60-million-years-worth of sediments eroded from the Rocky Mountains and carried east to form the Great Plains. 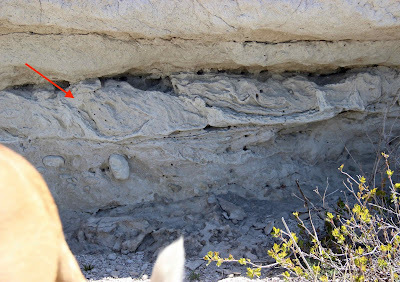 A good amount of wind-borne volcanic ash from Utah and Nevada ended up in the mix, and lots of mammalian carcasses were buried. 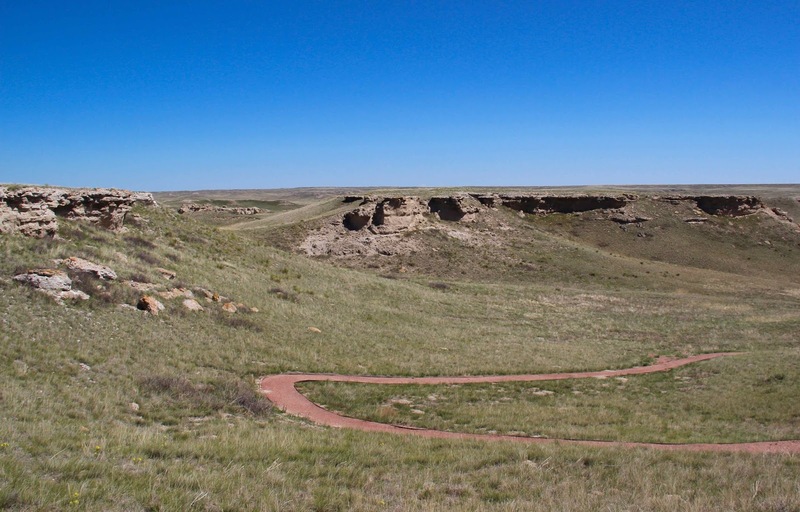 Three major pulses of deposition created the Great Plains from Rocky Mountain debris. Source. 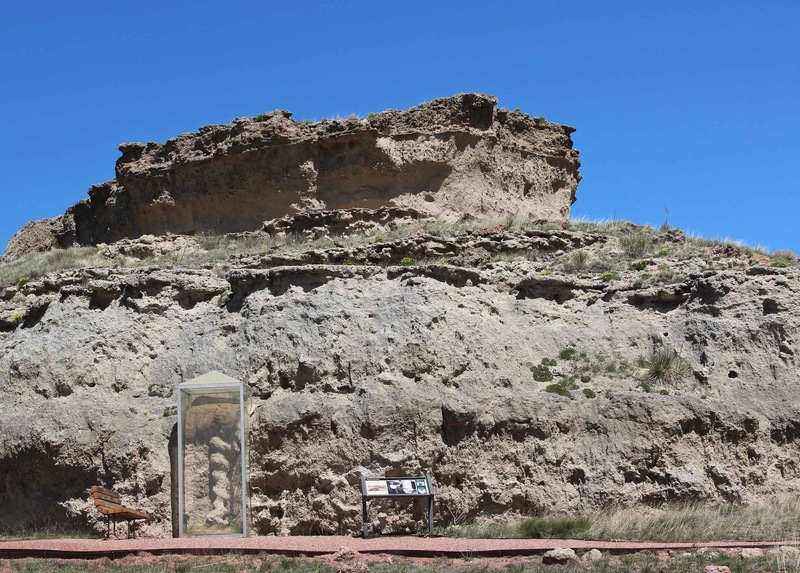 Then about 130 years ago, a man was visiting his sweetheart on the upper Niobrara River when he spotted a fossilized leg bone sticking out of a rock. 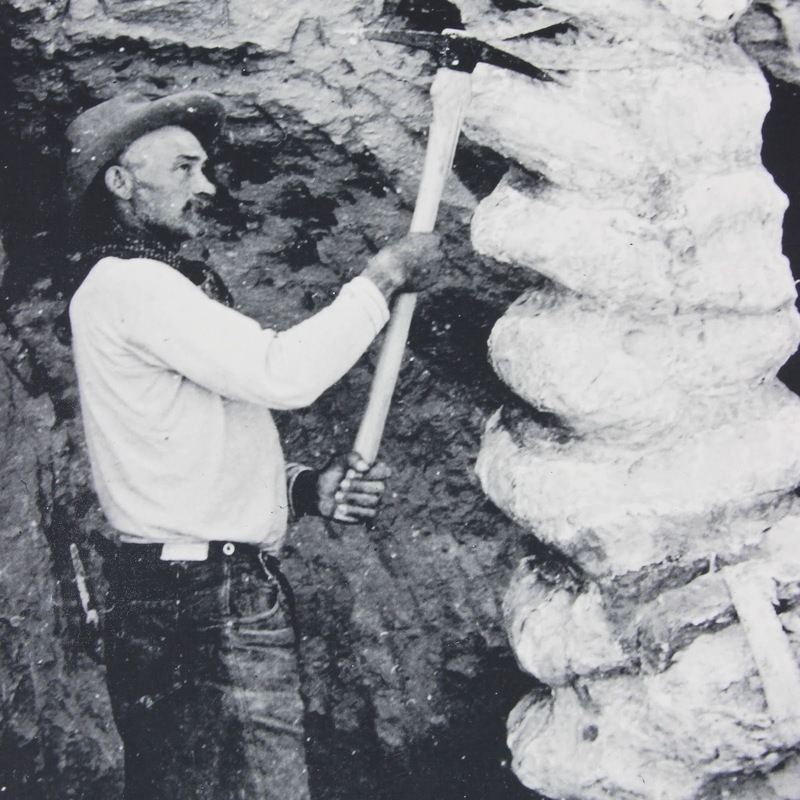 James Cook soon married his sweetheart, bought the Agate Springs Ranch from his father-in-law, and continued to find bone fragments and curious inexplicable features. A Devil’s corkscrew or daemonhelix. 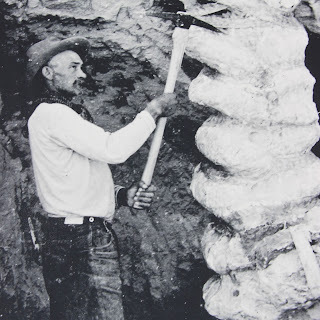 Cook contacted paleontologist Olaf A. Peterson of the Carnegie Museum in Pittsburgh, Pennsylvania. Peterson visited the ranch in 1904, starting paleontological studies that have continued off and on to the present. 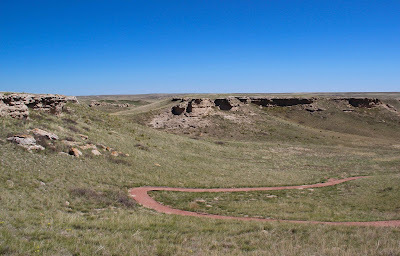 The ranch (now a National Monument) turned out to be a key site in the amazing record of prehistoric life on the Great Plains. “The great bonebed at the Monument remains one of the most impressive and scientifically interesting paleontological sites in North America” (Graham 2009). Entrance to Agate Fossil Beds National Monument in northwest Nebraska. NPS photo. Why so many bones in one place? 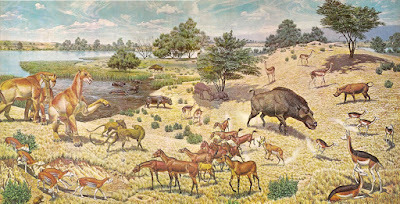 Paleontologists think that during an extended drought, thirsty starving dying animals gathered at the muddy remains of waterholes. 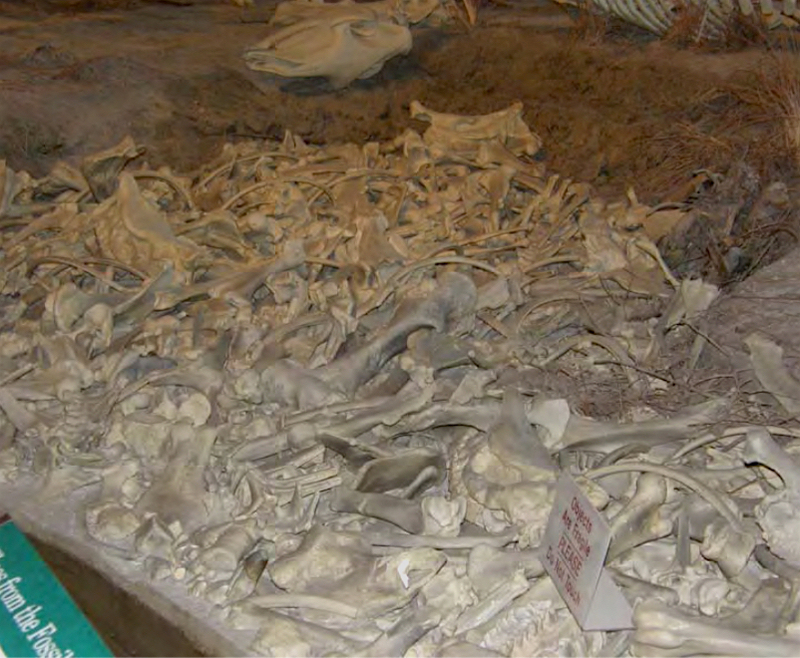 Carcasses accumulated, were torn apart by scavengers, and trampled by the still-living. Then the river flowed again, burying dismembered skeletons in sediment. Eventually the sand, silt, volcanic ash, and bones became rock. 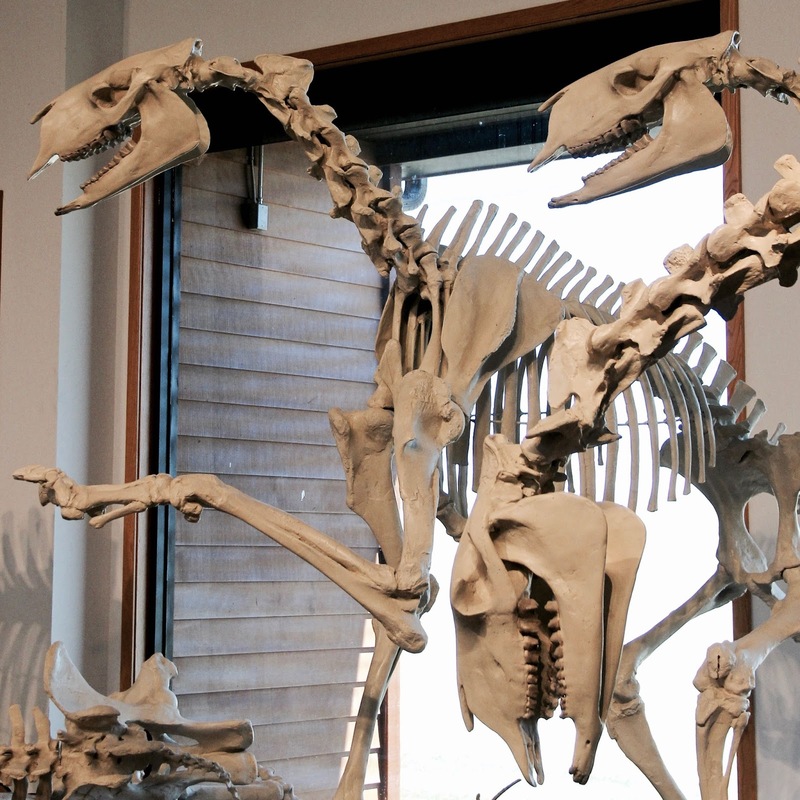 When the Niobrara River carved its valley, it exposed bone-filled sandstone and siltstone. Bone slab from Carnegie Hill—part of a diorama in the Visitor Center. University Hill in the distance, so-named because the University of Nebraska had a fossil quarry there. Even though Agate Fossil Beds National Monument is a key site for the best record of one of the most spectacular evolutionary radiations ever documented, visitation is light. I met only one person on the trails, the Artist-in-Residence. It was a cool calm spring day, brilliant in the sunshine. 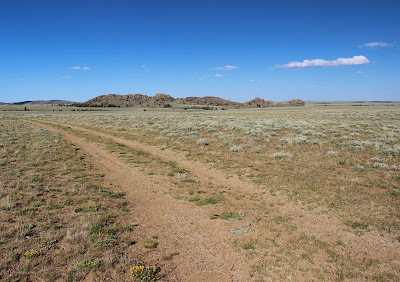 I walked through rolling grasslands beneath blue sky that seemed to go on forever. Sometimes I could just make out a ghostly multitude of mammalian creatures—some huge, some kind of familiar, others quite strange—chalicotheres, rhinoceroses, entelodonts, beardogs, … oh my! 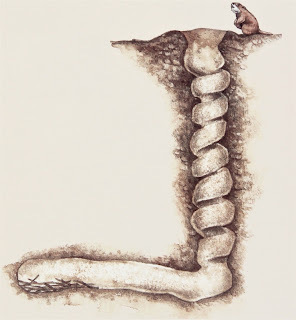 Devil’s corkscrews turned out to be fossilized burrows of the dry-land beaver, Paleocastor. Tracks of ancient mammals in ashy lime mud, dog tail for scale. 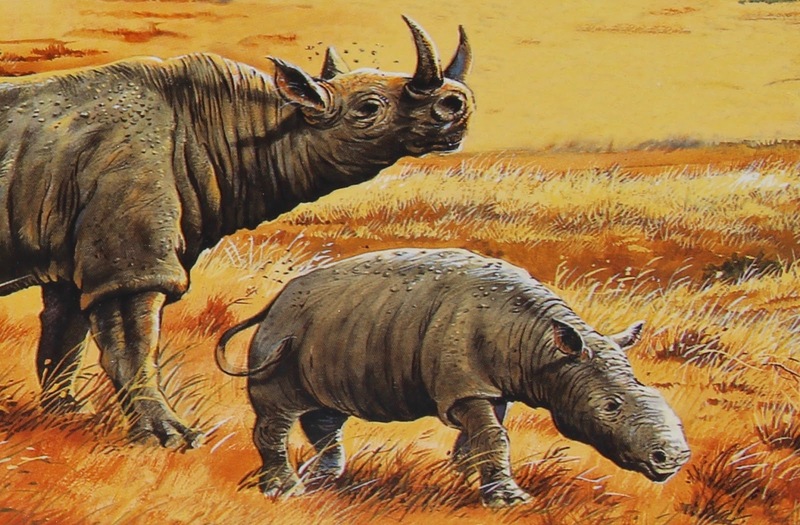 Rhinos were really common. Diceratherium niobrarense on left, and the smaller Menoceras. The dreaded beardog, Daphoenodon, was the largest carnivore in the area, about the size of today's wolf. 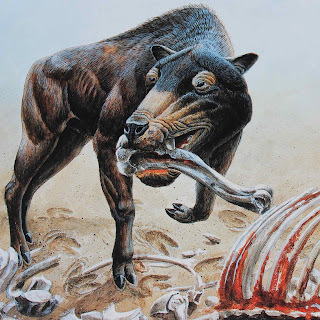 It was neither a bear nor a dog, but a member of the extinct family Amphicyonidae. Scavenger Dinohyus, the “terrible pig." It was not a pig but an entelodont. Some stood six feet tall at the shoulder, about the size of a male American bison (our “buffalo”). In the distance, a herd of Morupus approaches the muddy remains of a water hole, filled with carcasses and bones. Moropus was a chalicothere, an extinct group related to horses and rhinos. Three chalicotheres stand in air-conditioned comfort. 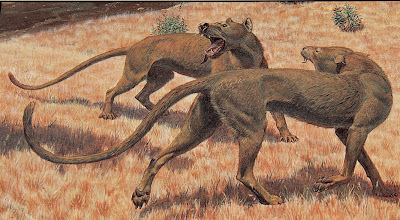 A beardog, two entelodonts, and three chalicotheres meet at the waterhole … (you supply the punchline). 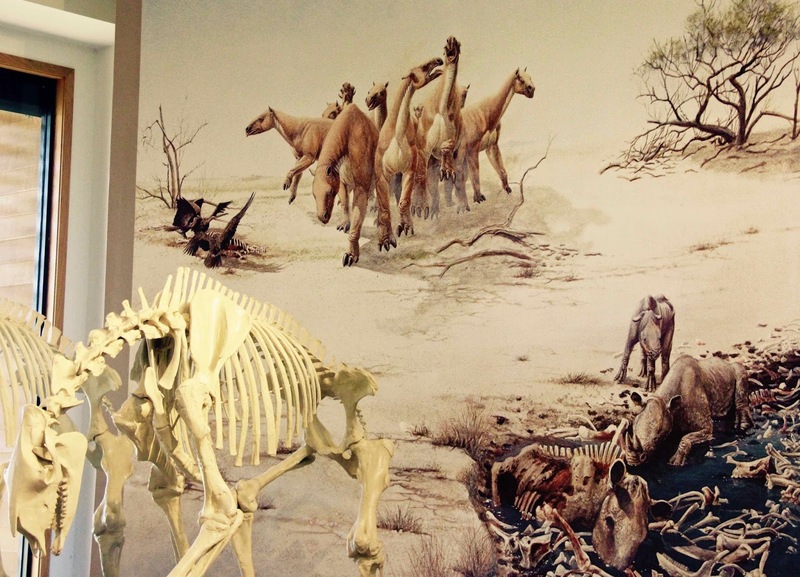 The beautiful scenes and portraits of Miocene fauna come from the Monument’s trail signs and Visitor Center. Graham, J. 2009. 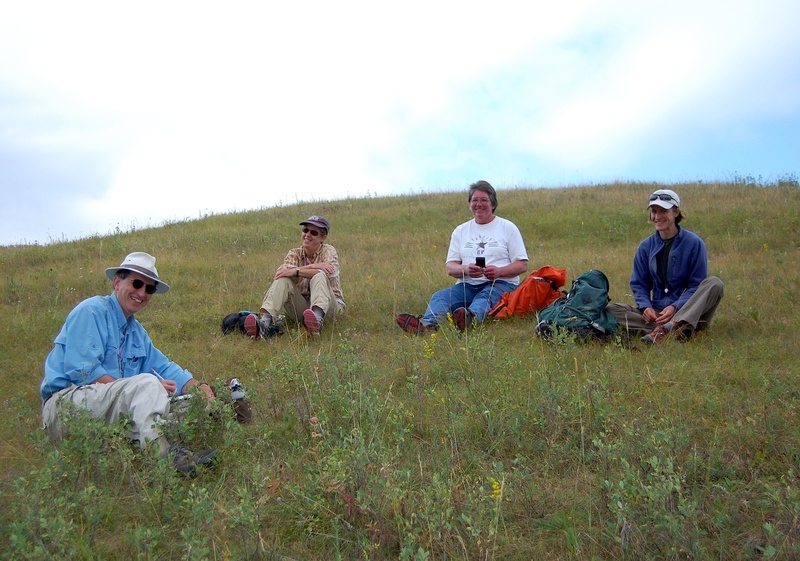 Agate Fossil Beds National Monument Geologic Resources Inventory Report. Natural Resource Report NPS/NRPC/GRD/NRR—2009/080. 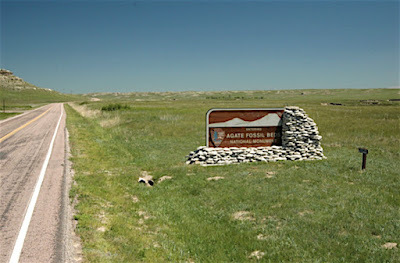 National Park Service, Denver, Colorado. PDF here. Maher, HD, Jr., Egelmann, GF, and Shuster, RD. 2003. 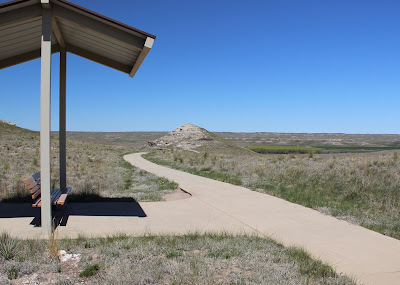 Roadside geology of Nebraska. Mountain Press Publishing Company. Prothero, DR. 2006. After the Dinosaurs, the Age of Mammals. Indiana University Press. Trimble, DE. 1980. The geologic story of the Great Plains. U.S. Geological Survey Bulletin 1493. Available online. Early June is the time for a tree-following report but … once again I’ve neglected my service berry. It’s become obvious that I picked the wrong tree. It’s too far away. It’s been a snowy spring. Now I have a lot of work. Maybe I’ll get back in late summer … maybe. But there is plenty of news from tree-followers around the world. Check it out at the virtual gathering kindly hosted by The Squirrel Basket. Instead, I’m posting some experimental tree images, for I’ve been learning Pixelmator. I bought it last year, thinking it was time to get a true image editor. I had aspirations Preview couldn’t fulfill. Reviews were enthusiastic; at $29.99 it was cheap (still is). But then I didn’t use it … until last week. I needed a figure for a paper about Black Hills Montane Grasslands—which I’ve been working on for years. Yes, this is my albatross! Let me tell you my epic tale. You see, I’m not a Compleat Scientist. I would rather put together blog posts—in fact do almost anything—than write a paper for a scientific journal. It’s a guaranteed way to take the joy out of a project. It was enjoyable, once upon a time. Photo by D. Ode, 2011. 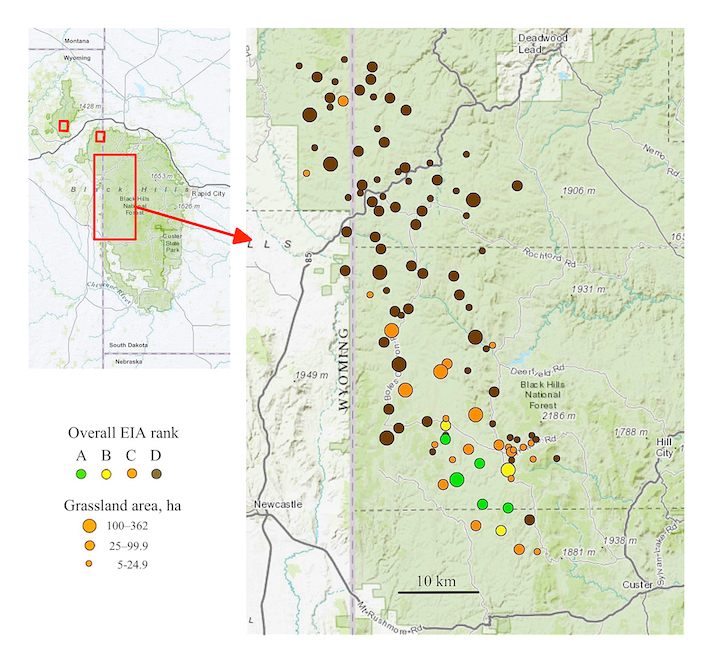 Native Black Hills Montane Grasslands (green and yellow dots) now occupy only 10% of original habitat. One morning last week, I awoke knowing the manuscript was almost ready to submit, but I needed a figure. I sighed with dread, collected my jpegs, and opened Pixelmator. About an hour later the figure was done! 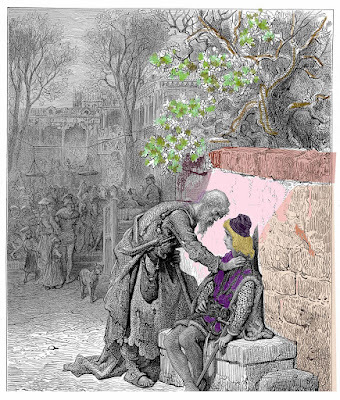 I was excited—not about the paper, but about this easy and powerful image editor. I see a lot of fun creative opportunities ahead. 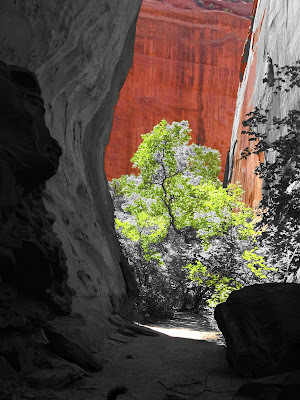 I’ve had it in mind for awhile to experiment with mixing color and black-and-white. The image at the top of the post was my first try. It was so easy … not just to do, but to learn how to do (it helps to have experience with Photoshop and understand layers). I made a duplicate layer, converted it to black-and-white, and used the “Magic Eraser Tool” to reveal some of the colors underneath. It took just a few minutes of trial-and-error to make something interesting, something I liked. That is magic! This boxelder tree grows in Long Canyon off the Burr Trail, in Escalante-Grand Staircase National Monument (Utah). The Magic Eraser removed parts of the overlying black-and-white layer. 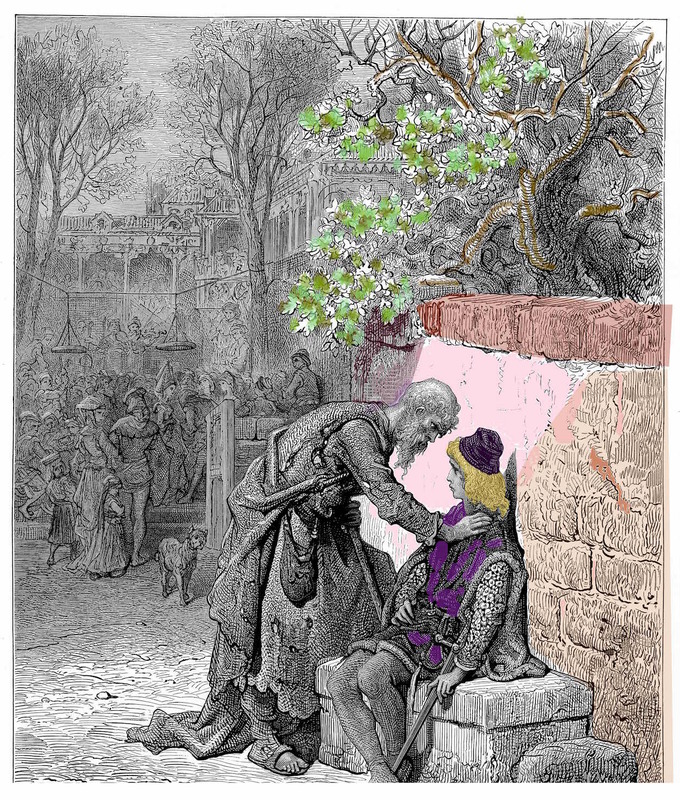 It’s also easy to add color to black-and-white images—to create the look of old hand-colored photos, which I love. The subtle beauty is something to aspire to. 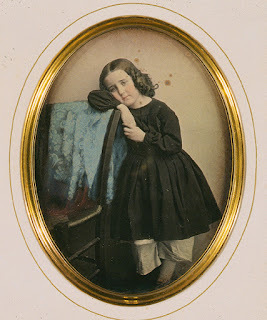 J. Garnier, hand-colored daguerreotype, circa 1850. Source. 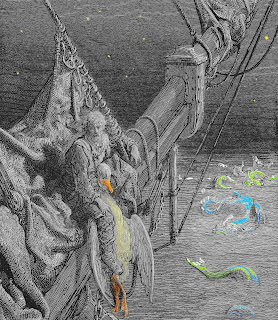 A crude first try: My muse—the Ancient Mariner with his albatross. 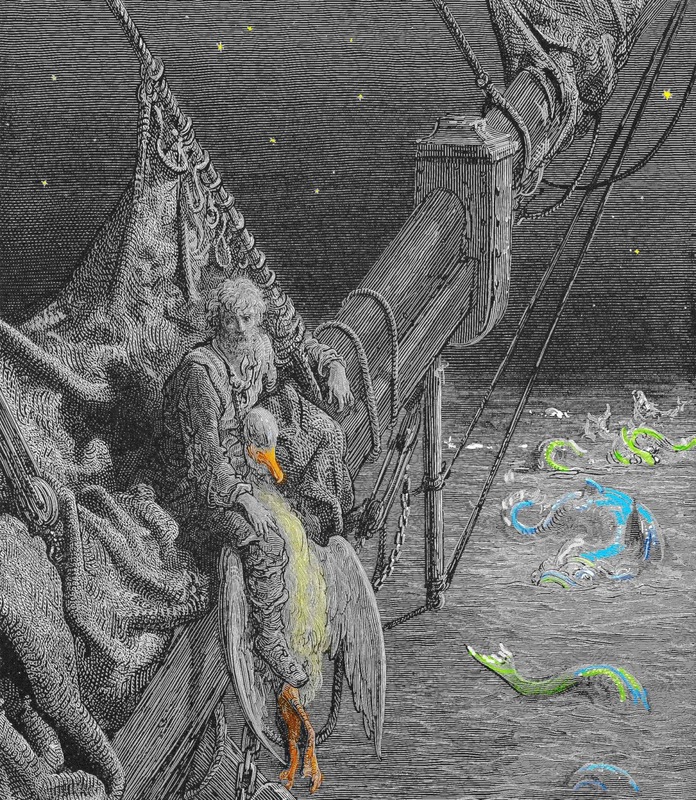 Original illustration by Dore, from Coleridge's Rime of the Ancient Mariner. Source. The American Serengeti. Where are we ... and when? Be forewarned, happy scavenger—good times never last. The rolling land is covered in grass, for as far as the eye can see. Hackberry trees, tall grasses and lush forbs line the streams … usually. But not now. Instead, there are hordes of thirsty starving animals. Predators feast upon easy prey, but soon they die too, as do the scavengers—all victims of a terrible drought. Yet it was because of climate change that they lived at all. The bones pile up, are buried in sediment, become encased in rock. Then a cattle rancher finds some sticking out of a hillside, leading to a remarkable fossil quarry with millions of well-preserved bones. The animals rise again, to dwell in air-conditioned comfort.